NCUK stands for The Northern Consortium UK, an educational charity established in 1987 by 11 of leading UK Universities. With over 30 delivery centers across the globe, it’s objective is to prepare international students for UK universities. NCUK is a registered educational charity in UK and owned by leading UK Universities. It is monitored by QAA (Quality Assurance Agency), the same agency which overlooks quality of education for all UK Universities. NCUK British Academic Center at British Council is the only delivery center in Thailand. Why NCUK is with British Academic Center at British Council? To ensure best teaching from our expert teachers which has international recognized qualifications and wide range of experience, NCUK has established a good partnership with British Academic Center having a diverse experience in International education arena. British Academic Center with campuses in center of Bangkok, outstanding locations which surrounded by BTS sky train, MRT, and department store. What is International Foundation Year (IFY) of NCUK? The NCUK International Foundation Year (IFY) is a modular program that will prepare you for first-year entry to undergraduate degree courses. Students have a choice of streams in Business, Engineering, and Computing; where they can study a combination of modules that fit in with their degree destination. 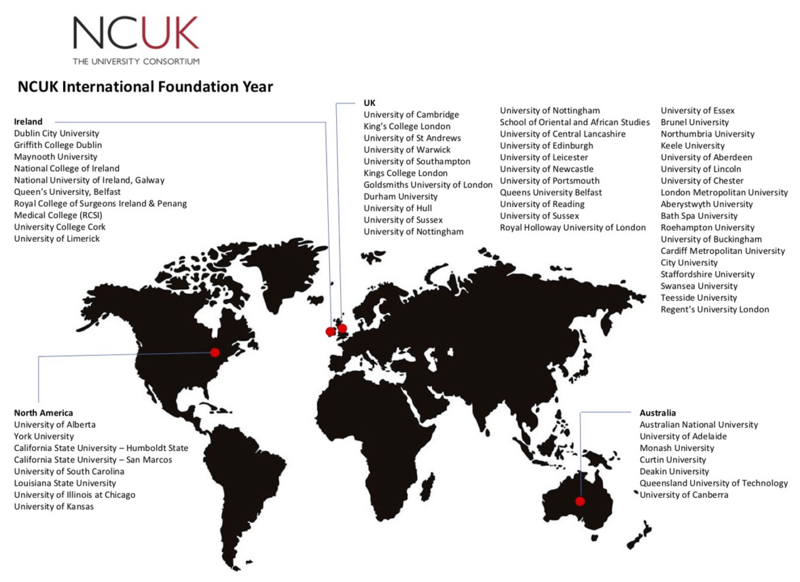 NCUK-IFY is now recognized by NARIC-UK as equivalent to US, UK & Australian GCE-A level’s entry to Universities. What is International Year One (IYONE) of NCUK? Our International Year One is the equivalent to the first year of an undergraduate level program and successful students can progress directly into the second year of selected undergraduate degree courses in the UK. It can be studied as a one year program or after completion of the IFY. Subject pathways are available in Business and Engineering. When does the admission process start with NCUK? Admission for the academic year starts in May of each year. Final decisions on admissions are decided once the results are announced. Is there an entry test required to enter NCUK? An interview is required for all candidates. What are the minimum academic requirements (Eligibility) for NCUK admissions? How many times a year does the NCUK offer admissions? For the time being students are admitted once a year for the fall semester, beginning in September. The process begins in May. 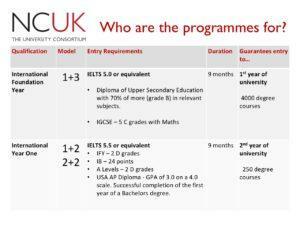 What programs NCUK British Academic Center offer? offers Engineering, Computing & Business and Science streams in Thailand, which opens up 4,000 Undergraduate programs in UK. How does NCUK guarantee my place in UK University? NCUK is owned by leading UK Universities which means a guaranteed place for all NCUK students in UK Universities. What is the fee structure of the whole program? NCUK British Academic Center charges $18,333 for IFY and $19,166 for IYONE per Year. Can a student give the fee in installments? Installment can be considered upon the approval of the center management in case to case basis. Are there any scholarships or discounts offered? Scholarships in UK University is up to 50% in each year. Many scholarships are offered to NCUK student only. Can the NCUK deposit fee payments of $3,000 be made online? Only bank drafts are accepted in the name of “ ABAC STUDY ABROAD AND BRITISH ACADEMIC CENTER”. If a student drops out of the course, is there any refund for him/her available? If a student after a year or two of study is unable to continue with his studies, will he be awarded any certification? The student will receive a certificate after the completion of NCUK international Foundation Program (IFY) and NCUK International Year One (IYONE) which is acceptable internationally. NCUK programs are internal, acceptable to the 11 owner universities. Our programs are the same as those studied by students in the UK, assessed by both course work and examinations. Marking is done both in Thailand and in the UK. If a student wants to apply for a course that is not in the Entry Directory –can he/she apply? NCUK Entry Directories list all courses in which NCUK students have been placed in the past. If you want to apply for a course that is not listed in the Directory you should contact a member of the NCUK student service team. 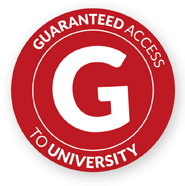 For the IFY it is possible to add courses to our progression arrangements. For the International Year One it is unlikely that a new route can be added. Where can a student find descriptions of NCUK courses and details of NCUK universities? Details of all the NCUK programs are available on our international website. Does NCUK train teachers at the delivery centers in Thailand? Yes, all teachers/lecturers receive training in style and methodology of teaching and in assessment and evaluation as expected in UK higher education. The lecturers in the centers mark all exams and continuous assessments internally. They are then moderated externally by NCUK in the UK. This is in effect a second marking. Is there a re-sit exam if a student fails? Yes, re-sit examination schedules are available with the teaching centers. How do the students find out their exam results? There is an announced date for releasing exam results. Students will be given certificates and transcripts on or after this date. How does NCUK ensure teaching standards at the delivery centers? NCUK programs comply with the British Quality Assurance Agency (QAA). Regular audits are carried out to ensure academic quality. Does NCUK offer any masters degree program? Pre-Masters programs will be available in Thailand by Next Year. After completing 4 Years who will Award my degree? Graduating University in UK will be the awarding body, for example if you have completed your degree with Manchester then The University of Manchester is the awarding body. After completing two years at British Academic Center, can I transfer to local program? NCUK program is non-transferable to any local program. What happens after completing 9 months in NCUK- British Academic Center ? Once you have passed your IFY at NCUK British Academic Center, our placement team will assist you plan for any of our UK partner University. You can apply for any US, Australian or European University for Year 1 of Undergraduate study.